I recently had the privilege to take a pelagic (open ocean) birding trip with the Marine Science Center out of Ponce Inlet [map]. This is the same organization that heads the pelagic trips for the Space Coast Birding and Wildlife Festival. The festival trips tend to stick to the western side of the Gulf Stream. In recent years, we’ve not even ventured that far. Instead we stuck to the near-coast waters. The trips that head out over the summer and fall are longer-ranging. The goal is usually to head out to the middle of the Gulf Stream. This increases the odds of seeing pelagic birds that never venture near to shore. We headed out early in the morning, well before sunrise. There were thunderstorms well ahead of us, and the lightning as the storms crept up from the horizon was beautiful. At one point soon after sunrise, we had a flock of mixed seabirds along the horizon-line. I could make out some shearwaters and terns, but did not get a decent look at the Black-capped Petrels that others reported. This would have been a life bird for me, but I could not differentiate them from the terns and shearwaters, so I did not claim them. 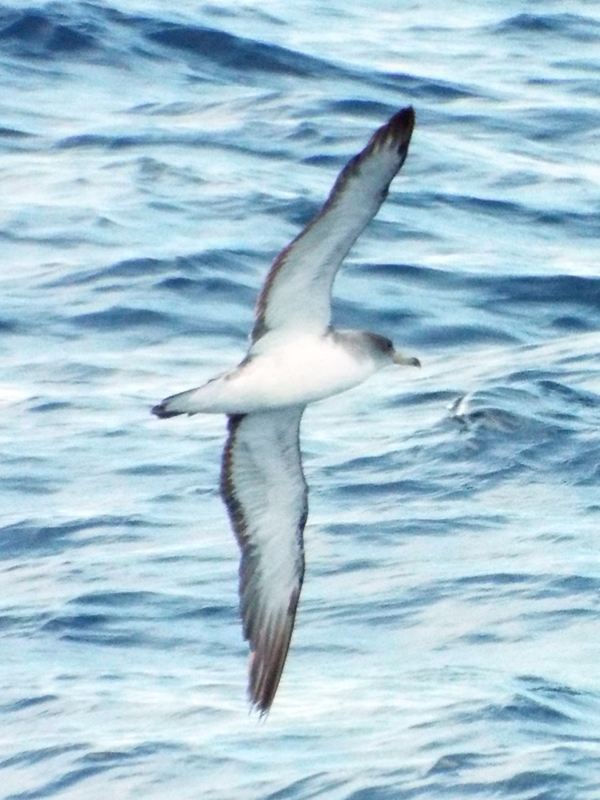 The headlining species for the trip was the Cory’s Shearwater. If you recall from my New England trip, I saw this species as a life bird during a whale watch; however the numbers on this trip were much higher, and we came across group after group, resting on the sea. 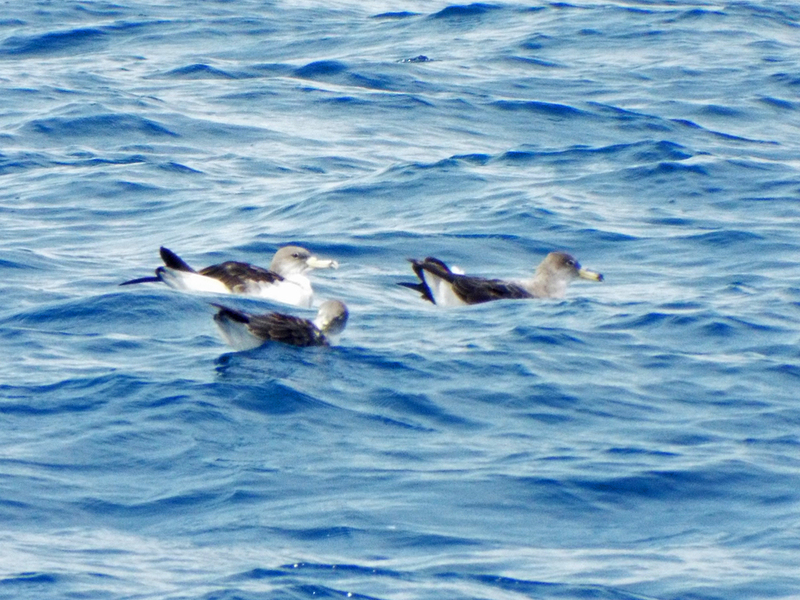 A few Cory’s Shearwaters resting on the ocean. There are two subspecies of Cory’s Shearwaters – one that nests off Africa and another that nests in the Mediterranean. Both were present here, thousands of miles away from their breeding grounds. 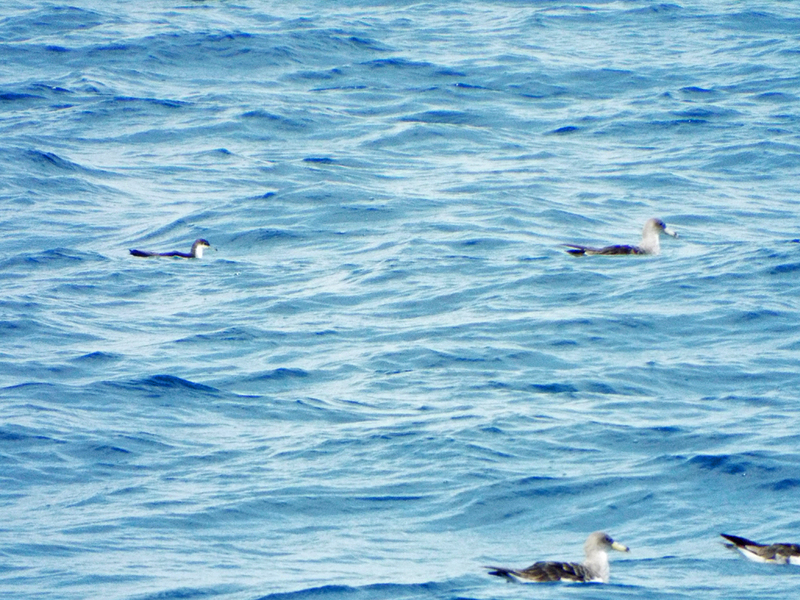 Like many shearwaters and other pelagic predators, these birds range far and wide. 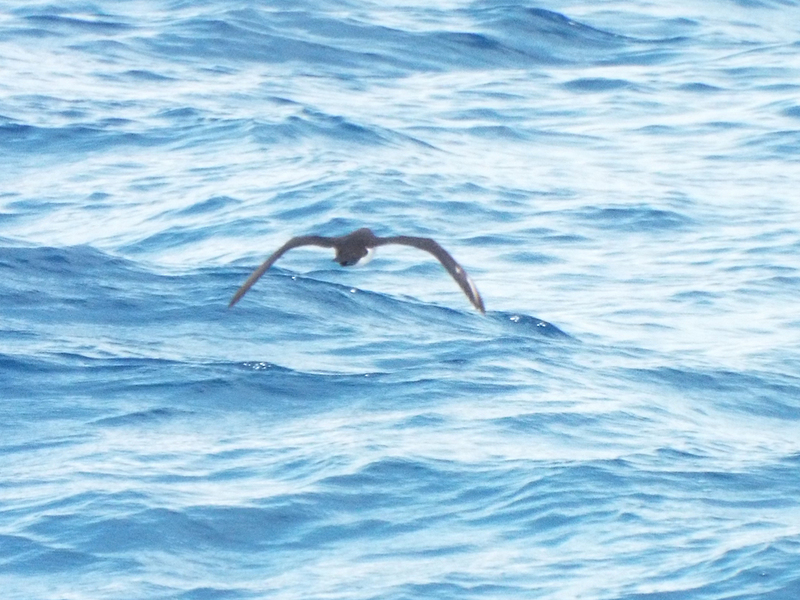 Shearwaters have a distinctive flight pattern where they soar and then tilt to one side, perpendicular to the water. They’ll often skim one tip close to the surface. Along with the Cory’s, we had a good number of the smaller Audubon’s Shearwaters. I still find it surprisingly difficult to photograph birds from a boat, so below you’ll see my best attempts at getting an Audubon’s Shearwater. Audubon’s on the left, Cory’s on the right (in the mid-ground). We had a few other notable encounters, including a Prairie Warbler, a Hooded Warbler, and even a Barn Swallow – all well out to sea. There was a Brown Booby and several Jaegers (we saw all three jaeger species). We ran into a few pods of dolphins, mostly Atlantic Spotted. The first large group we saw seemed to be a mixture of adult and adolescents. I suspect they were males, but I don’t know for sure. 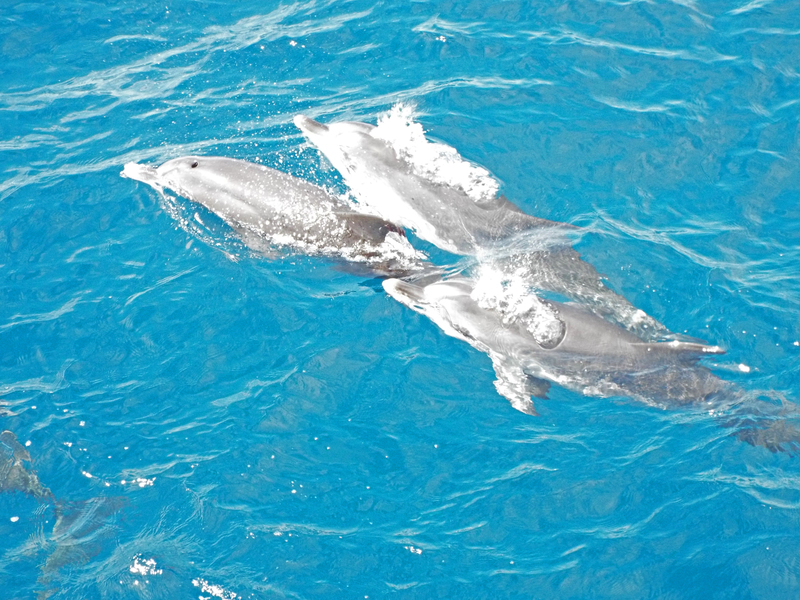 Young Atlantic Spotted Dolphins (notice the lack of spots). On other trips, we’ve let the dolphins ride the bow wake, which they seem to love. I noticed that on this trip, the captain slowed or stopped the boat whenever the dolphins approached. I don’t know if there are some wildlife protection laws now being followed, or some conservation “best practices”, but some of the dolphins seemed to be hanging around the bow, waiting for us to move. We did eventually move once most of the dolphins dispersed. I noticed a few seemed to sneak in while were were under way (I didn’t say anything). Here’s a short video of them around the bow of the boat. If you listen closely, you can hear the squeaks and whistles as they communicate with each other. One reason I say these were males is because a short time later, another pod came racing toward us. This time there were single adults, many with a calf alongside. I assume these were females and their babies. As with previous SCBWF trips, the moms seemed to be trying to display their babies to us. They would push the babies along one side and up toward the surface wherever we were hanging over to look. I was so excited to see this, I forgot to take any photos or video! Sorry. On the way back to shore we had some Sooty Terns and a few Bridled Terns, as well. These species are very rare to see from the coast. Our final treat was a flyby of a Sabine’s Gull, the only life bird on the trip for me. We had several hundred (!) hatchling and washback sea turtles on board that we were supposed to release into Sargassum (floating seaweed) one we got out into the Gulf Stream. Unfortunately, we could not find any suitable size patches or lines of Sargassum for the turtles, so the poor things had to make the trip back to shore. There will be another attempt to get them out from another location. I love these pelagic trips, so it is with some concern that I learned the boat we were on (that’s been used for every Florida pelagic trip I’ve done), the Pasttime Princess, is to be sold. This was its last trip, at least in this incarnation. Michael Brothers (from the Marine Science Center) said these trips, including the SCBWF, will continue in some fashion. Still, it was sad to say bye to the Pasttime Princess and the crew. Posted on 2016 September 29 2016 September 29 by Lonely BirderPosted in BirdingTagged Birding, birds, birdwatching, dolphins, Pelagic Birding Boat Trip.